Title on the front cover: "Mixed Up". Title on the spine: "Mixed Up + Extras : Remixes 1982-1990 + Torn Down". 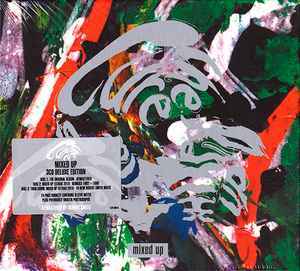 This compilation (p) 2018 Fiction Records Ltd. & (c) 1990 Fiction Records Ltd.
"The Cure's celebrated 1990 remix album remastered with an additional extra CD of 11 vintage remixes and new remix album 'Torn Down'"
Track 1-9 has a shorter outro than on the original CD issue, making it 5:28 and not 5:41. CD1: All tracks subtitled "Remastered 2018" on back cover and booklet. Completists take note: 1-9 "The Caterpillar - Flicker Mix" on this version of Mixed-Up is about 12 seconds shorter than the original U.S. cd. The long fade at the end seems to have been edited.